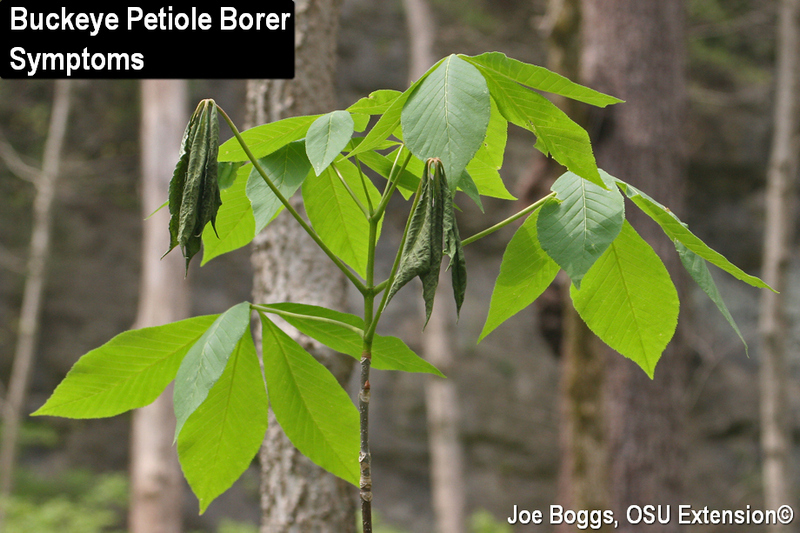 The handiwork of the Buckeye Petiole Borer (Proteoteras aesculana) is now becoming evident on its namesake host in southern Ohio. Individual caterpillars of this tiny native moth bore into leaf petioles to disrupt vascular flow causing leaves to droop, wilt, and turn dark green to black. Damaged leaves will eventually detach producing mild defoliation. Symptoms may superficially resemble frost or freeze damage. Look for a slight swelling, a spot-like discoloration, and a small hole in the petioles of affected leaves. Small quantities of sawdust-like frass (insect excrement) may hang from the hole. Clean holes usually indicate the caterpillars have completed their development and have exited for pupation. Damage by this borer may appear conspicuous; however, the caterpillars seldom cause enough leaf loss to affect the overall health of infested trees. So, no chemical control recommendations are currently available. On the other hand, I've seen localized populations gradually build over time to produce very noticeable damage, particularly near streams. There are two generations per season in Ohio with the damage caused by the second generation becoming more severe. However, populations can be effectively reduced through digital suppression. Hand removal of infested leaves containing first generation caterpillars can reduce the damage caused by second generation caterpillars later this spring. Of course, the infested leaves must be destroyed and stomping is highly effective. Thus far, no populations have become resistant to this control method. Most of the petioles I examined this morning in a park in southwest Ohio contained late instar caterpillars meaning that hand-picking remains a viable option. However, the clock is ticking! With the current warm temperatures, I'd say a significant number of caterpillars may complete their development by early next week. This will remove the five-fingered discount as an effective (and satisfying) control option.